This volume provides a series of tutorials on mathematical structures which recently have gained prominence in physics, ranging from quantum foundations, via quantum information, to quantum gravity. These include the theory of monoidal categories and corresponding graphical calculi, Girard’s linear logic, Scott domains, lambda calculus and corresponding logics for typing, topos theory, and more general process structures. 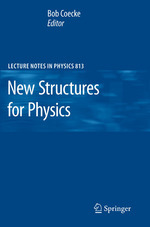 Most of these structures are very prominent in computer science; the chapters here are tailored towards an audience of physicists.